PDG Melbourne Head Office by Studio Tate. The demands of modern working life show no sign of abating. 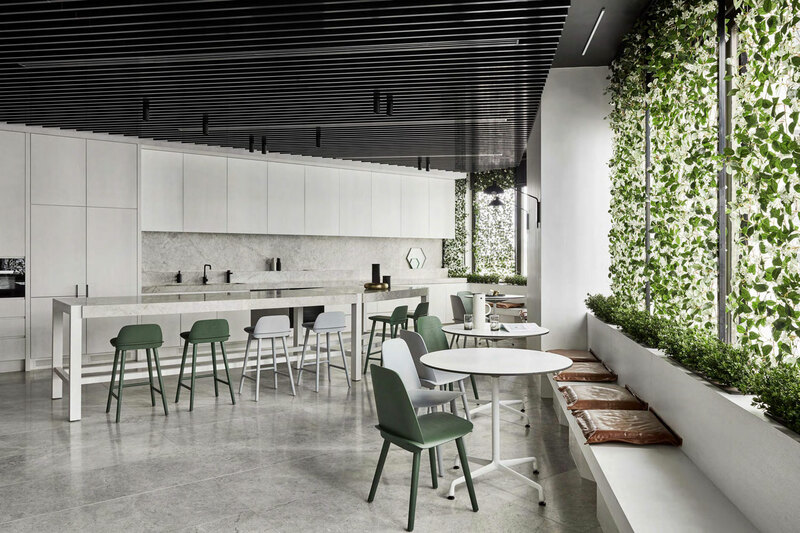 Forward-thinking employers are increasingly looking to workplace design to play a positive role in the wellbeing of their employees, whilst improving productivity, and reinforcing brand positioning and company values at the same time. One such business is Melbourne property developer who appointed interior architecture practice Studio Tate to redesign its Swanston Street, Melbourne headquarters.“PDG’s new head office gave us the chance to think differently about workplace design – this was an exciting collaboration with a valued, long-term client,” explains Alex Hopkins, Principal Interior Designer at Studio Tate. 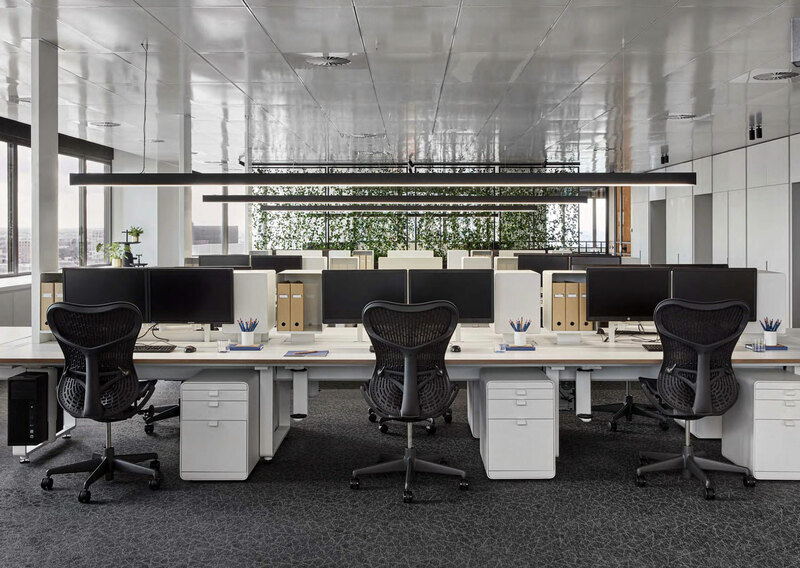 Located in a unique hexagonal building, formerly home to iconic Australian airline Ansett, the 950 square metre project called on intelligent design to improve internal communication and productivity, and facilitate a feeling of wellbeing. 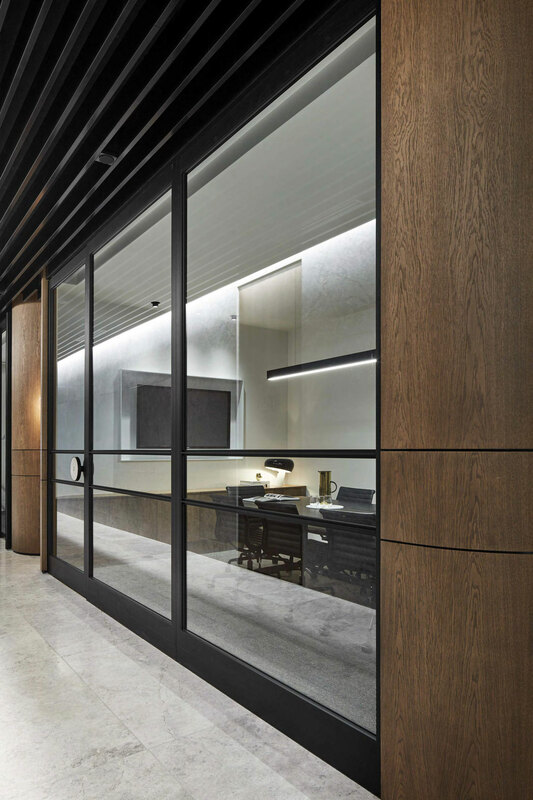 PDG had recently overhauled the public space of the building, and were seeking to recreate the same treatment in the headquarters – an office that looked more like a home or a hotel, rather than a typical workplace fitout. Paying tribute to PDG’s emphasis on high-quality projects and lasting relationships, Studio Tate’s concept teased out the subtle sophistication of the bespoke suit – made to fit an individual’s exact proportions using the finest fabrics, with every last detail considered, from the hand-stitching to button selection. 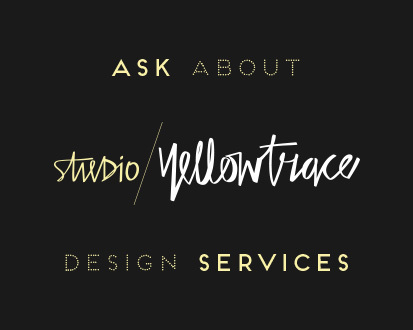 Related Post: Fancy Nance Salon By Studio Tate For Adriano Zumbo In Melbourne’s South Yarra. The design is split into three main areas: the entry and reception, CEO’s office and the workspace. 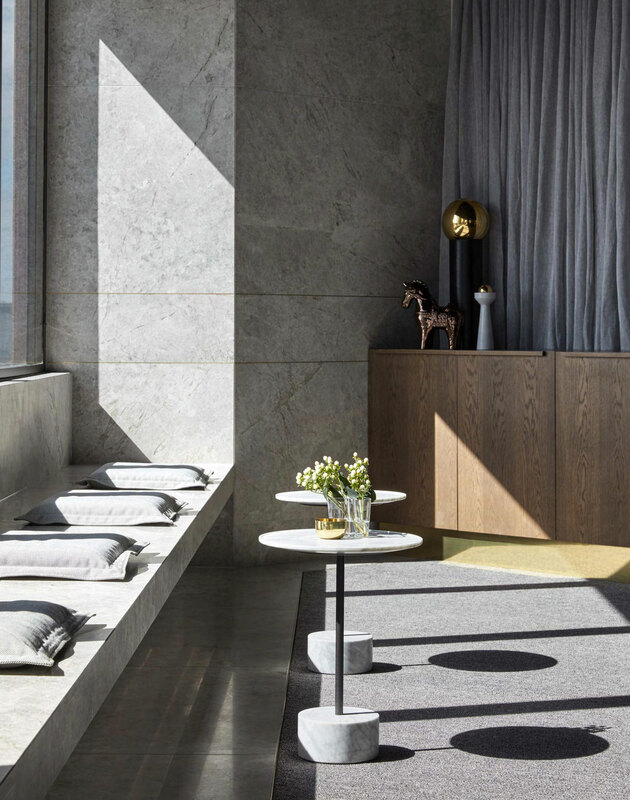 The proportions of the grand reception area invites visitors to experience the entry’s contemplative luxury, from stone floors to the curved geometries contrast with the hexagonal floor plate’s sharp edges. 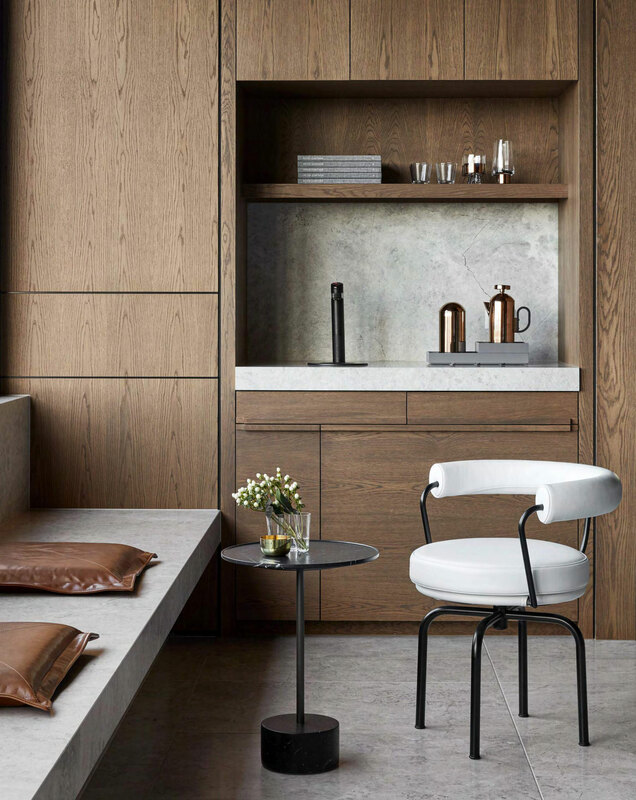 Surfaces are a sophisticated mix of textured materials in black, white and tan accented with walnut tones. 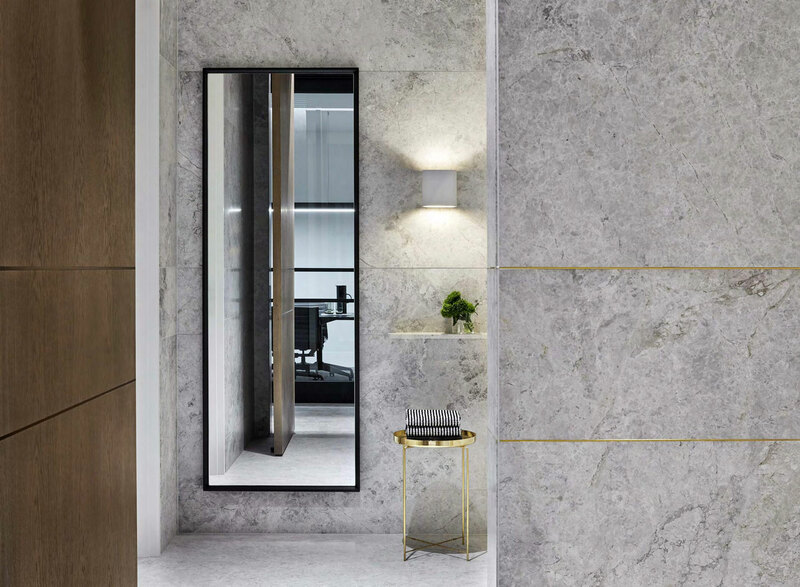 Features add points of intrigue, such as the brass datum running across the textured stone wall cladding, or the stone slab borders between each section of the floorplan, which mirror the wall’s curve. 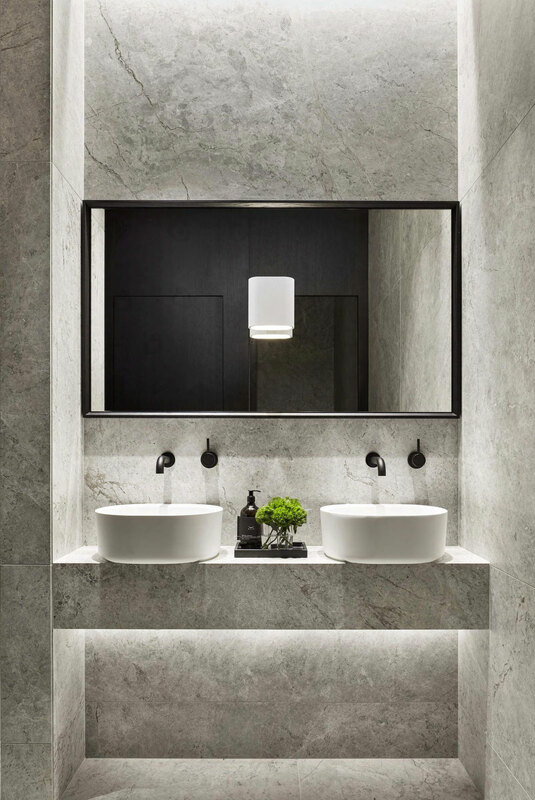 Lavish marble-clad bathrooms – fully integrated with the rest of the design – feature a level of materiality and attention to detail akin to a design hotel or high-end private residence. 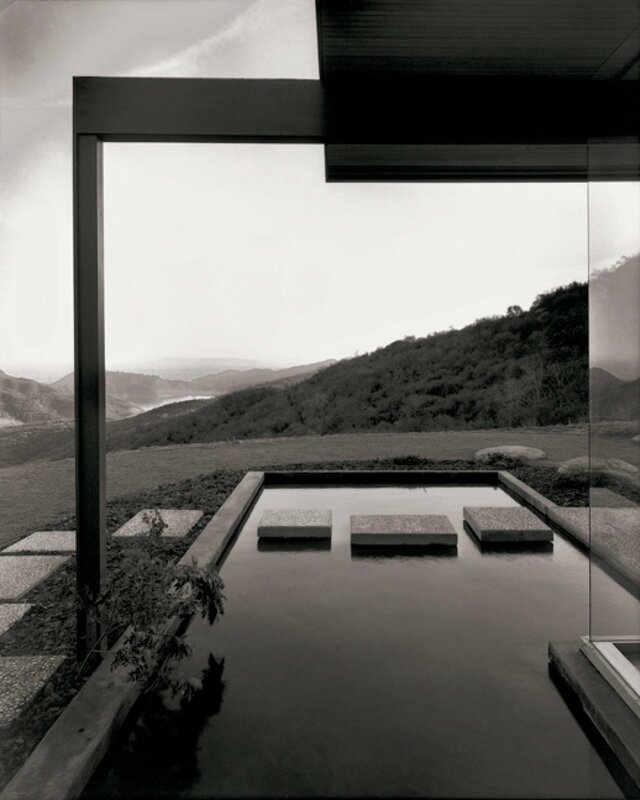 In addition to the interior architecture, Studio Tate were also commissioned for the selection of furniture and soft furnishings. 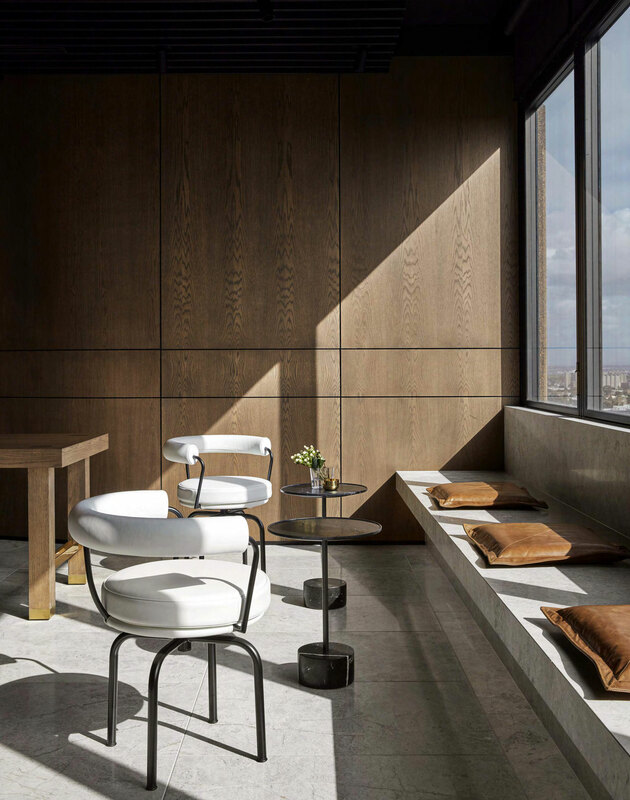 In the formal reception area, the dramatic furniture adds impact to the forms and materials, including a stone banquette positioned next to the window, and a walnut veneer reception desk with a stone surface and leather inlay. Hospitality was an important element in this project, so guests waiting in the grand reception area are invited to recline on a h velvet sofa and take advantage of the in-house espresso bar. 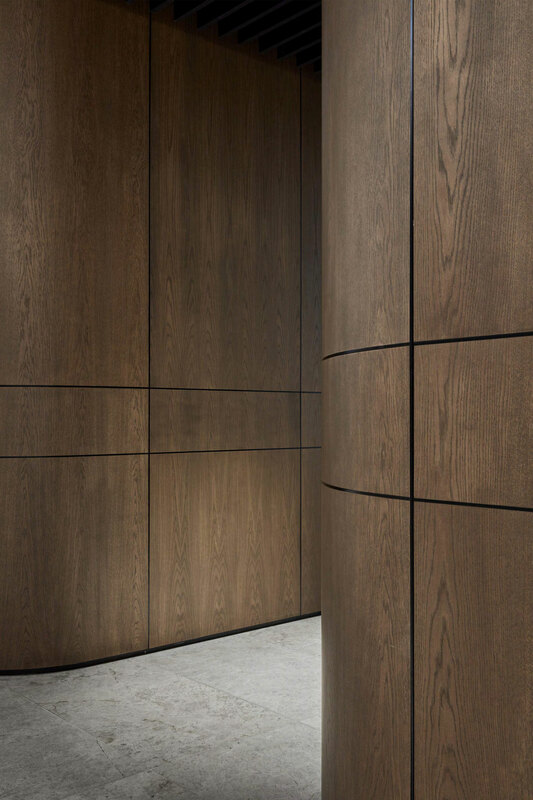 The CEO’s office follows a similar theme to the entry space, with a sweeping wall of in-built joinery, where cupboard and drawer fronts sit proud to accentuate forms and details. 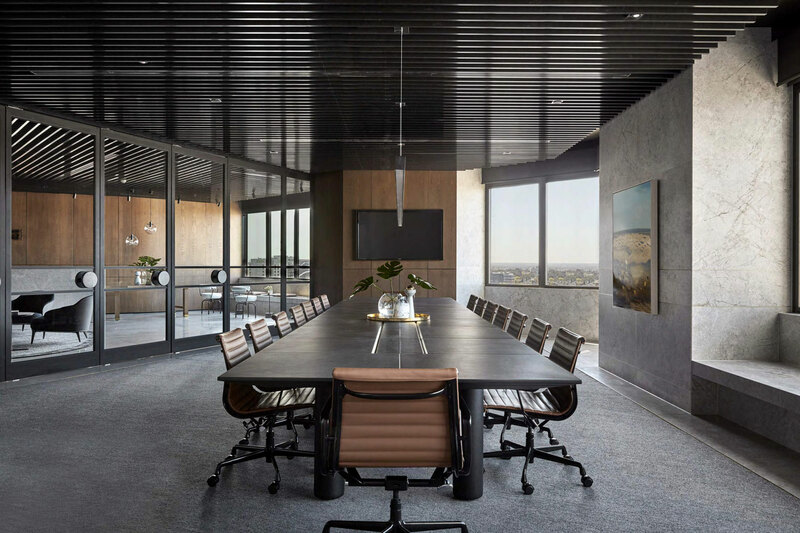 “In this office and the boardroom we have specified a cutting edge collection from Poltrona Frau with leather-clad table tops and legs. Feature lighting was sourced from a Canadian designer previously not used in Australia,” explains Hopkins. If front of house is formal wear, back of house takes the bespoke theme in a more casual direction, while keeping the quality high. 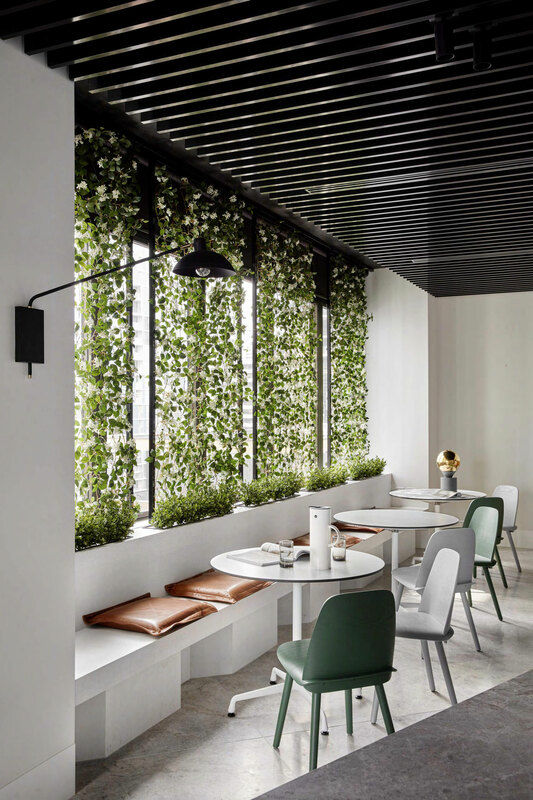 With reception features a sophisticated and subdued palette of black, white and tan, while the workspace plays off a more punchy palette with green and soft grey highlights, which is carried through to the informal hub and break-out space. As a property developer that is committed to the highest standards of construction, PDG’s new headquarters now accurately reflects the company’s values. 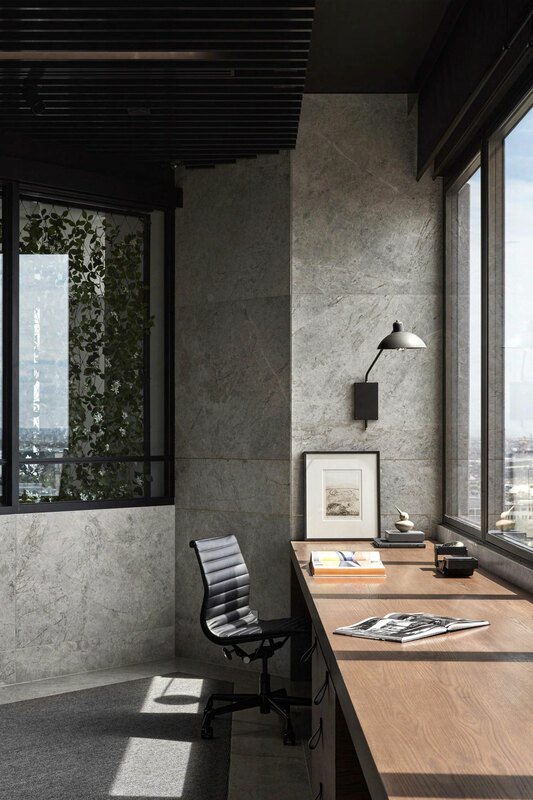 Designed with intelligence and finished with finesse, this project by Studio Tate is an undeniable contender for one of Australia’s most inspiring workplace designs. Respect. Elbphilharmonie Concert Hall by Herzog & de Meuron Opens in Hamburg. Wood Melbourne’s New Collection of Bathroom Products.